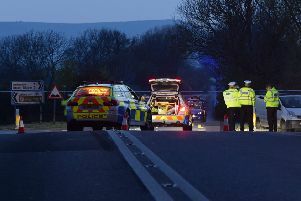 Two friends on a cycle ride are the latest to have been named as victims of the Shoreham air crash that claimed 11 lives. Tributes have been paid to Dylan Archer, 42, from Brighton, and Richard Smith, 26, of Hove. On Saturday August 22, Richard cycled from his home to meet Dylan, who was riding the bike he loved and made himself. They were due to join another friend for a ride in the South Downs but never arrived. Dylan’s family said he was a kind and loving father, partner, brother, grandson and friend, and his dry humour and generous nature will be greatly missed by all who knew him. Dylan grew up in the Midlands where he nurtured a lifelong passion for bikes and cars. He came to live in Brighton in 1991 and loved the area, especially the South Downs, and would have been heading for one of his favourite cycle routes, Coombes Road, and up on to the South Downs Way. Dylan was a trusted and respected IT consultant, co-founder and Director of a Brighton IT company. He leaves behind Alice, his partner of 17 years, their two sons aged 15 and 12, his sister Ruth and two-year-old niece. He was adored by them all. The family are very touched by all the tributes, and thank everyone for their kindness and generosity. “We would also like to extend our gratitude to Sussex Police, who have been amazing in helping us deal with this devastating loss. Richard’s family described him as lively and good humoured. He worked in marketing and web development at ActSmart, an independent company based in Hove, specialising in providing advice to the cycle industry. Richard grew up in Buckinghamshire before going to university in Birmingham. The family moved to Hampshire in 2008 and Richard returned from university to work in a cycle shop in Cosham. Two years ago he moved to Hove. Richard’s passions in life were for his family, friends and his beloved bikes. His boundless enthusiasm was infectious. He was a truly wonderful, caring and loving person. He leaves behind his partner Victoria, his parents Julie and Jonathan, and two much-loved brothers William and Edward. He will be sorely missed by all who knew him.